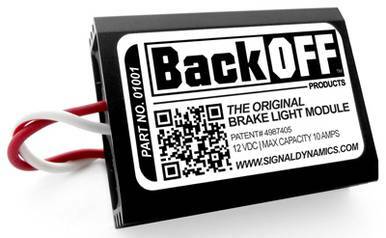 BackOFF™ Brake Light Module - AdventureTech, LLC. When you apply your brakes, it causes your brake light to automatically emit a visual alerting signal of 3 short light flashes, followed by 1 steady on light for 4 seconds. This signal automatically repeats itself as long as the brakes are applied. This pattern is not random, but has been selected because of its ability to gain and retain following driver's attention. Most states drivers handbooks recommend that you flash your brakes when slowing or stopping. The BackOFF™ automatically facilitates compliance and enhances safety. Install the BackOFF™ and see how much more effective your brake light can be.